Somewhat unique in their orientation the Transverse Ranges run east to west, stretching from the coast near Point Conception towards the Mojave Desert. The range includes the Santa Ynez and Topatopa Mountains, as well as the Northern Channel Islands. The Transverse Ranges also include a string of hot springs that follows the range’s east-west orientation. Within Santa Barbara and Ventura Counties there are close to a dozen hot springs sites distributed across the range. In Ventura County there are five fairly well known sites, two of which are open to the public. The sites are Vicker’s, Matilija, Wheeler, Willet and Sespe Hot Springs, the later two being in the National Forest and open to the public. Starting in the west, the first of these five sites is Vicker’s Hot Springs. The site is located in Matilija Canyon and features several handmade stone pools in and along Matilija Creek. The hot spring and surrounding land was recently purchased in 2012 by a group calling itself Ecotopia. The non-profit group has closed the site to public usage to help rehabilitate the land from overuse and intends to reopen the site this spring. The site is sometimes confusingly referred to as Matilija Hot Springs, which is the name of another hot spring site located two miles downstream, just below Matilija Dam. The area around Matilija Hot Springs was first homesteaded in 1872, but the man who put Matilija Hot Springs on the map was Abram Blumberg. Prior to Abram Blumberg, a resort had been built upstream along Matilija Creek, but was washed away in 1884 during a flood. In 1887, Abram Blumberg built a new resort at the current site, and even ran a daily stagecoach from Ojai to carry visitors there. The resort featured springs with such fanciful names as “Fountain of Life” and “Mother Eve”. Today the site is owned by the County of Ventura and is currently closed to the public. 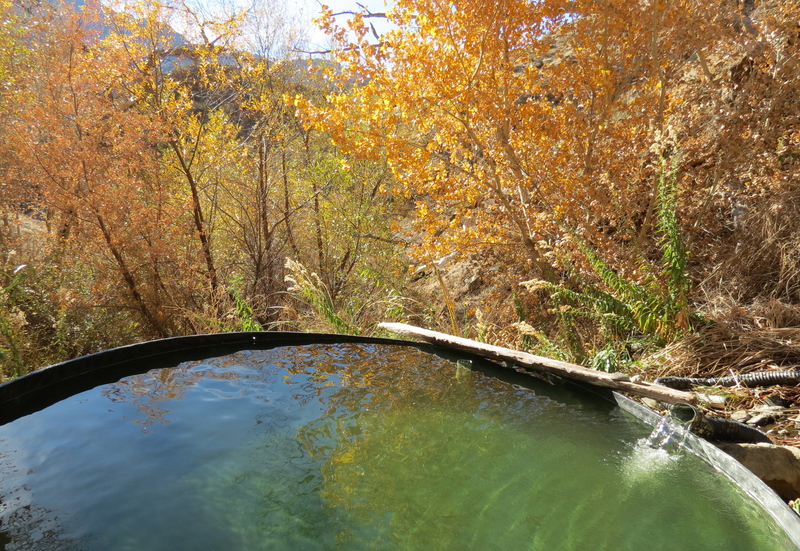 Wheeler Hot Springs is located along North Fork Matilija Creek. Although likely known to the Chumash, the site is said to have been “discovered” by Wheeler Blumberg, Abram Blumberg’s son. In 1888, while hunting, Wheeler Blumberg shot a deer, which fell near the spring. Wheeler Blumberg then homesteaded at the site, and in 1894, built a resort there. Over the years the resort has gone through many incarnations and owners, and has faced a number of natural calamities including forest fires and flooding. The resort was last open to the public in the late 1990s. Back then, a typical visit might include a relaxing soak in one of the wooden tubs on the site, followed by a massage. Afterwards one could enjoy dinner and an evening of jazz music. Perhaps one day the site will be reopened. While these first three sites are currently closed to the public, both Willett and Sespe Hot Springs are open. 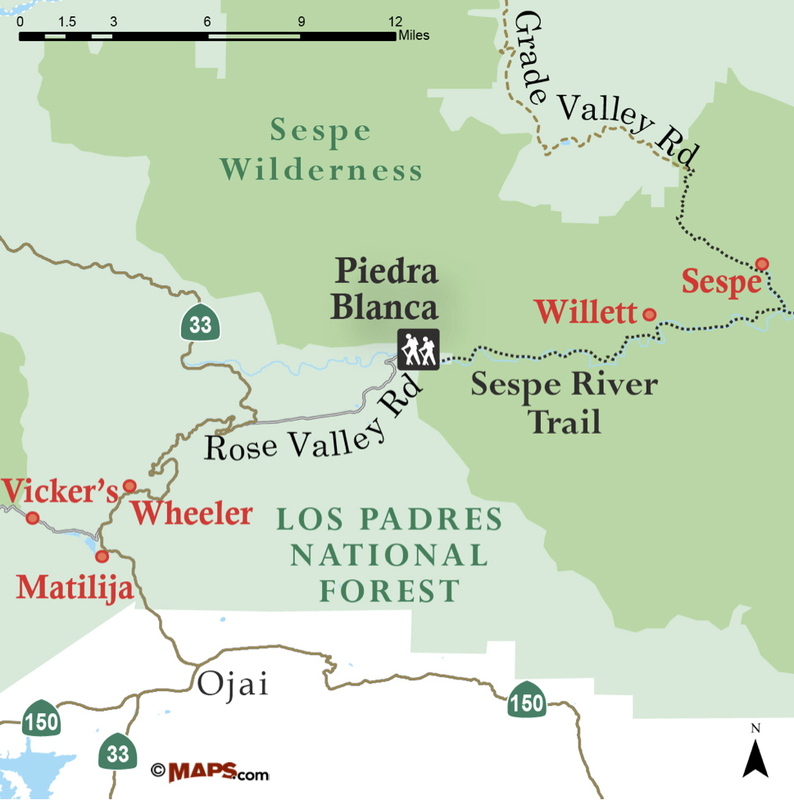 Both sites are located within Sespe Wilderness in Los Padres National Forest. The sites are best visited as part of 2 to 3-day backpacking trip as the only way to reach the sites is on foot or by horseback. The most common route to the hot springs is along Sespe River Trail starting from Piedra Blanca Trailhead. Willett Hot Springs is about 10 miles from the trailhead and Sespe Hot Springs is about 6 miles further, past Willett. The trail includes a number of camps along the way. To get to the trailhead from Ojai, take State Route 33 north. The road follows North Fork Matilija Creek, past Wheeler Springs, before climbing out of the valley. At the top, the road levels out and arrives at the turnoff for Rose Valley Road. Turn right on to Rose Valley Road and continue past the turnoff for Rose Valley Falls, and stay to the left at the turnoff to Middle Lion Campground. Rose Valley Road ends at Piedra Blanca Trailhead. The parking area includes space for horse trailers. An adventure pass is required to camp or park in this part of the National Forest. During the 1960s and 1970s an unpaved road led from Lion Campground, just past where Piedra Blanca Trailhead is now, all the way to the hot springs. The road was closed to motor vehicles in the late 1970s following heavy winter storms, and Lion Campground was later closed in the early 1990s to protect sensitive habitat. From Piedra Blanca Trailhead, Sespe River Trail follows the old road bed most of the way and is in good condition for hiking and horseback riding. The trail is one of the more popular routes in southern Los Padres National Forest. Along the trail one can find various side trails that lead down to improvised camps, however the first official trail camp is Bear Creek Camp, about 4.5 miles from the trailhead. Bear Creek Camp has several fire rings, and water can typically be found in Sespe Creek at the site. During the drier times of the year more appealing water can be found just upstream in Bear Creek. Another reliable water source along the trail is Kerr Spring, which is about a mile further past Bear Creek Camp. The turn off to the spring is not marked, but the side trail is noticeable and leads a short way to the spring. The next campsite past Bear Creek Camp is Oak Flat, about seven miles from the trailhead. The site is noticeable from the trail and includes a fire ring and two picnic tables. Water can currently be found flowing upstream from the camp. At about the 9.5-mile mark, the trail arrives at the turnoff for Willett Hot Springs. The trail to the hot springs crosses Sespe Creek at a right angle and arrives near the old homestead of Jaklin Willett. Here, one can find several campsites. From the homestead, a trail leads another half mile, uphill to the hot springs. The site is tucked in a small canyon, where hot water issues from the rocks and is channeled through a plastic hose into a large tub. The tub is about eight feet across and two feet deep. To reach Sespe Hot Springs from Willett, continue downstream along Sespe River Trail another 3.25 miles to Johnson Ridge Trail. Here, the trail branches with Sespe River Trail continuing east towards Alder Creek Trail, and Johnson Ridge Trail continuing north, upstream along Hot Springs Creek towards Sespe Hot Springs. About a half mile from the trail junction, Johnson Ridge Trail passes Sespe Camp, even here the water is somewhat warm. A half mile later the trail branches. Johnson Ridge Trail continues to the left, climbing out of the canyon towards Mutau Flat. And an unnamed trail to right, continues another half mile to Sespe Hot Springs. 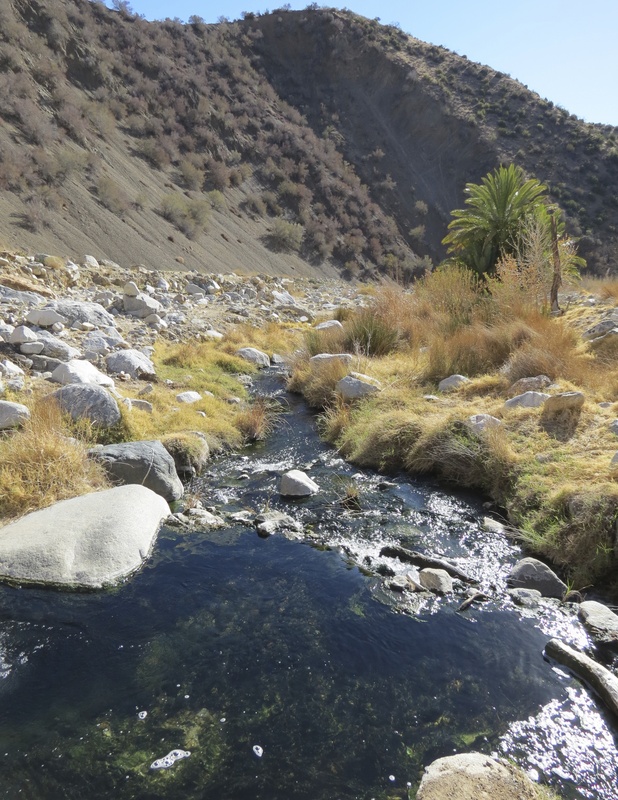 Sespe Hot Springs are the least developed of the hot springs and perhaps the most impressive. Here, 190 degree water issues directly from the sandstone rock and feeds Hot Springs Creek. The water at the source is too hot for soaking, but by hiking downstream one can easily find a pool to their liking. There are two alternate routes that one can take to reach Sespe Hot Springs. The shortest is along Johnson Ridge Trail from the trailhead at Mutau Flat. This route is about 8.5 miles one-way, but does involve a lengthy drive to trailhead and access to the trailhead is closed seasonally from December to May. Another route is from Dough Flat, following Alder Creek Trail to Sespe River Trail. This route is about 12 miles one-way, and access to the trailhead is also closed seasonally from December to May. An overview of the different hot springs located within the southern Los Padres National Forest can be found at http://www.fs.usda.gov/Internet/FSE_DOCUMENTS/fsm9_033979.pdf. This article originally appeared in section A of the January 4th, 2014 edition of the Santa Barbara News-Press. Water Report: Sespe Creek has some intermittent water in it. Water can be found in Piedra Blanca Creek early on, and at Bear Creek Camp, although the better water is in Bear Creek itself. Kerr Spring is a steady flow, water can be found flowing just upstream from Oak Flat, as well as in nearby Kimball and Timber Creeks. There is water at Willett, and the Sespe is flowing at Hartman. Hot Springs Creek has water in it from Sespe Hot Springs and a side creek with coldwater is flowing near where the trail to Sespe Hot Springs branches off from the Johnson Ridge Trail.